Difference between revisions of "Dark Area"
Sorry for our appearance, but this article currently needs a lot of work! 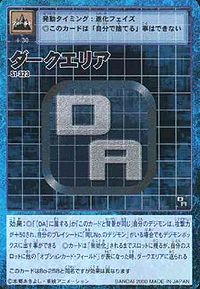 The Dark Area (ダークエリア, Dāku Eria) is the part of the Digital World where all evil Digimon originate from and is also the "graveyard of deleted data". It is a place formed from pure darkness and negative energy. It is unknown how far or deep the Dark Area extends but there is land within it. Demon, one of the Seven Great Demon Lords has a castle there and so does an immortal Digimon called Gran Dracmon. It is said that Gran Dracmon is related to how the area was created. The Dark Area has been used to seal away many evil Digimon in the past. 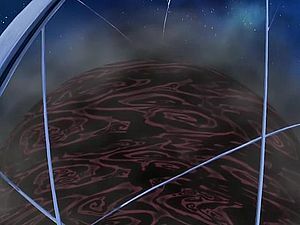 The Dark Area is a dark orb of energy at the center of the Digital World where Lucemon was banished after being defeated by the Warrior Ten. From within it Lucemon was still able to recreate the Royal Knights to gather the energy necessary to free him. After becoming Lucemon Falldown Mode he returns to it briefly to recruit the "corrupted souls", who were also imprisoned there, to open a gateway to the real world. The Chosen Children arrive and battle Lucemon Falldown Mode before he enters the portal and defeats him. 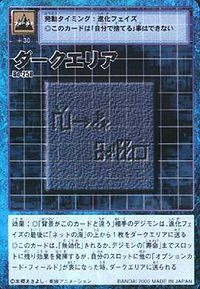 However, when he is scanned he leaves behind a black Digitama that assimilates the Dark Area as it evolves into Lucemon Satan Mode. Lucemon Satan Mode carried the Dark Area in its arms, while inside the Dark Area was Lucemon Larva, who controlled Lucemon Satan Mode's movements. On his second attempt Susanoomon breaks into the Dark Area and knocks Lucemon Larva out of it causing the Dark Area to fall apart.